Best pet fish for a toddler - Which fish, What to feed them and Cost. Blog Best pet fish for a toddler - Which fish, What to feed them and Cost. Best pet fish for a toddler – Which fish, What to feed them and Cost. There are so many options when it comes to fish keeping these days, and questions like, do I want a freshwater fish, a saltwater fish, big fish, small fish, colorful, dark, what is the cost, the list goes on and on. So, how do you figure out for a Childs fish tank. What fish is best for a toddler to keep? The best fish for a Toddlers bedroom fish tank are ones that are hardy, not stressed easy, can withstand inferior water quality ( Not that we Advocate having poor water quality ) and the odd toy being dropped into the aquarium. Thankfully some of the best Tropical fish fit that bill. Let’s take a look at some of the most popular fish for Toddlers and Small kids bedroom fish tanks. Before we get into what fish species we will want for our aquarium, let’s talk a little about husbandry. Because if your husbandry is lacking, then your fish no matter how hearty a species, will just not do well. Husbandry is all the things that makeup fish keeping. Things like lighting, water quality, water temperature, appropriate food and habitat, even the size of the aquarium. Many salt and freshwater fish grow to be very large, so it is important to set-up an aquarium that will give your fish plenty of room to swim around after they have reached maturity. Also, you should plan on how many fish you want. For a toddler, one fish is probably plenty, but some fish are very tiny so having a few of them could work just fine. Just be sure the aquarium is set-up to take the extra load. Meaning, more fish more poop, and that means more water changes or at least a better filtration system, which is also on the list of things to consider. A general rule for keeping any fish species is to try and replicate their natural environment as close as possible. The more natural the lighting, water temperature, and food, typically the better your fish are going to thrive. Best Fish Tanks For Toddlers Here! Which fish are best for a Toddlers Aquarium? Figuring out which fish is the most suitable for your toddler may be a little difficult at first, but with a little research, finding that perfect fish is very possible. In this article we will cover a little about some of the heartier fish species, that would likely due well being cared for by such a young new beginner. 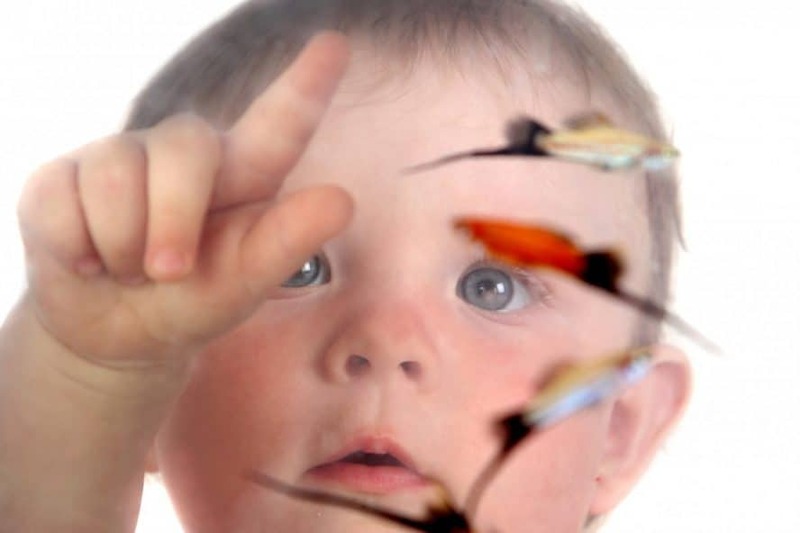 Guppies are a great starter fish for toddlers. They are native to the tropical region of Northeastern South America but have been introduced all over the world. Guppies are naturally very adaptable and tolerate changes in their environment better than most other species. These adaptive capabilities have enabled them to populate almost every region of the world, even ones containing brackish water. So, if you let the tank go every now and then, Guppies will typically do just fine. But keeping quality water parameters and proper feeding, are always recommended. They thrive well on small pellets or flake foods like Hikari Fancy Guppy Food. 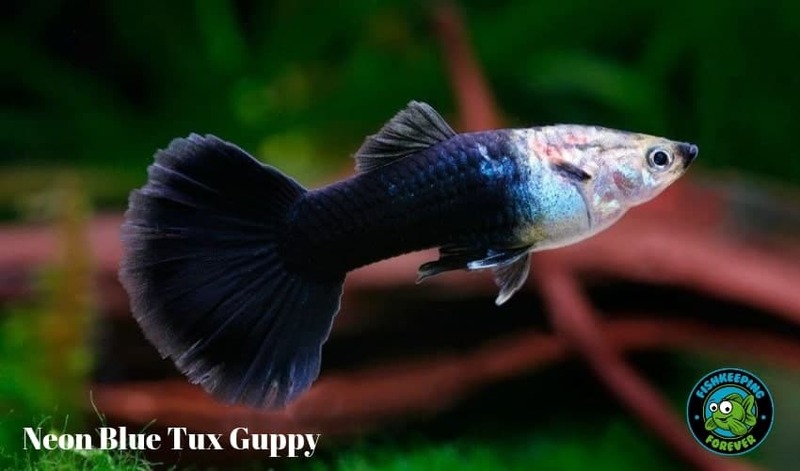 Guppies sell for as little as $0.50 cents each and up to $25 dollars for fancy specimens. Swordtails and Mollies are put together, because, even though they are a different species, they belong to the same family. Swordtails and Mollies are in fact, so similar in species, that cross-breeding between the two species has been successful. Since they are also in the same family as, their cousin the Guppy, they can be found in the same tropical waters. Some of which are very brackish and dirty. They tend to be good eaters and like more of a group setting. So, if you forget to clean the tank this week, your Swordtails and Mollies will forgive you. What Do You Feed These Fish? We use Tetra Color Flake Food. Swordtails, Mollies, Guppies, and Platies all belong to the same family and are found living in the same regions. So, they all typically do well on the same diet. Most of these fish that are sold today are captive bred, so they never have to hunt for their food. Most flake or pellet food is accepted and can be found in just about any local pet store. Always read the label to make sure the food you have picked, is formulated to meet your fishes specific dietary and nutritional needs. 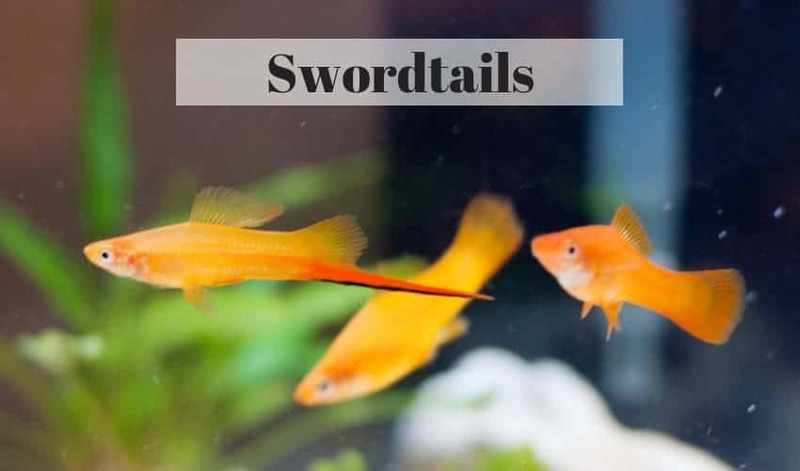 Swordtails and Mollies typically sell for a $1.50 to $6 dollars each. Almost everyone can remember having a Goldfish at some point in their life. Why? Because they are tough. Most people turn to Goldfish when their toddler starts to take an interest in fish keeping. Goldfish can be found in almost every color configuration imaginable. You can find solid gold ones, spotted ones, white ones, even Goldfish the color of a rainbow, so this, variety, has led to its great popularity. It’s easy for a toddler to find one they like. Goldfish are a very hardy species and are able to tolerate even some of the worst environmental conditions. Goldfish are actually from the carp family, which can be found in very brackish water in lakes and streams. Typically, they are good eaters, so having to deal with sometimes picky or finicky fish is not a problem. Some Goldfish can grow to be quite large, so having an aquarium big enough to accommodate their adult size should be considered. Goldfish thrive on pellet or specially formulated goldfish flakes. We use Tetra Goldfish flakes. Goldfish can sell from $1 to $5000 dollars depending on species. Also, goldfish can do okay on their own, but they actually seem to act livelier when they have a tank mate. 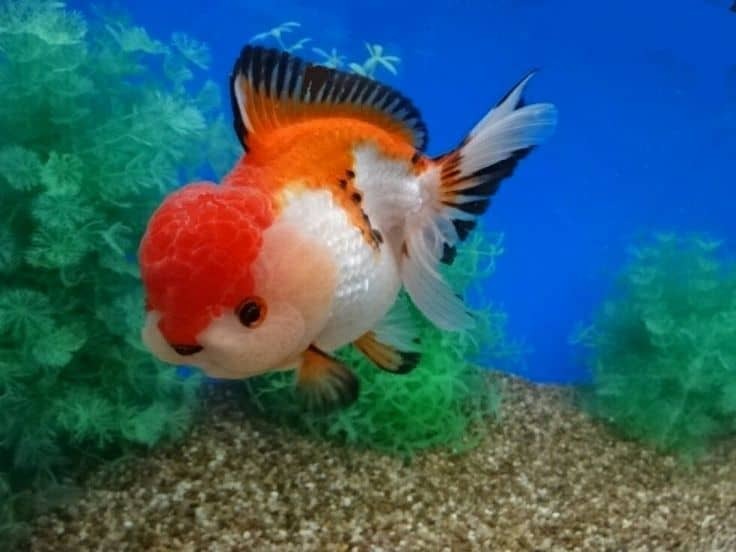 A Koi Carp set one of the all time records for the most expensive pet fish ever sold at $1.25 Million Dollars. GloFish look amazing and Toddlers love them. Glofish are actually a genetically modified fish that emit a fluorescent glow. Zebrafish are the first species ever to be modified genetically with the fluorescent gene and were for sale to the public. Zebrafish were modified initially for the purpose of detecting pollution and chemicals. It was thought that certain fluorescent colors could signal the presence of pollution or certain chemicals in the water, enabling the scientist to analyze that specific environment. A handy tool when you are studying the entire lake or cannal system. Other successful fluorescent species include Tetra and Barb fish. With the Tetra offering some of the brightest colors ever achieved in a freshwater aquarium. Glowfish are very small, but they tend to be quite hearty and naturally would live in brackish water. Their diet consists of just about whatever commercial diets are available for them. They eat mini pellets, flake, or frozen food, always thaw frozen before you feed it. And always read the label to make sure it is formulated for their specific needs. 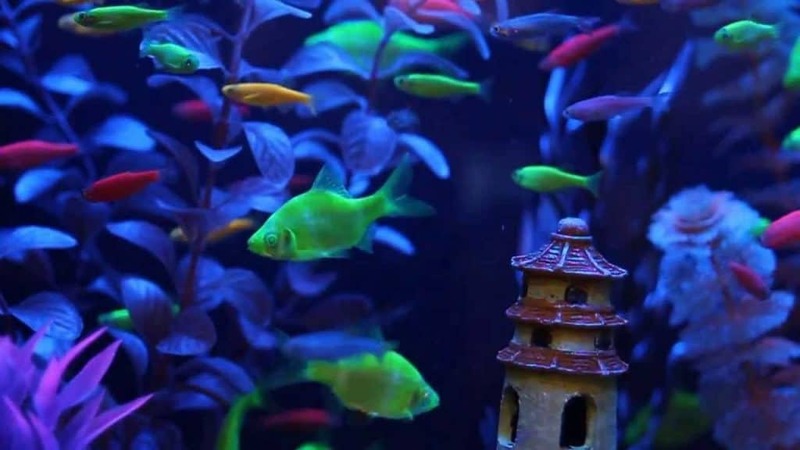 Glofish commonly sell for around $8 dollars each but are often sold in small groups. Bettas are hardy fish and look amazing. If you did not have a Goldfish, then you had to of owned a Betta, right? Like Goldfish, Betta fish come in a multitude of color combinations, and beautiful fin shapes. Their beauty has made Betta fish one of the most popular fish kept by beginner aquarists. Do not be fooled by their beauty though, Betta fish are very adaptable, and can be found living in some questionable water. Betta’s tolerate the aquarium getting a little dirty very well, another reason they might do well with a toddler. They do not really need constant attention and like to hide during the day. There are a lot of myths about Betta care so a little research will help you determine what kind of tank set-up you might want and keep your Betta as healthy as possible. If you feed your Betta correctly and provide them with good water conditions they can live a long and happy life. Read all about how long Betta fish live. Betta’s do not live on the roots of plants and need any of the diets stated to supplement their nutritional needs. If your Betta stops eating it’s a sign something is wrong, or is it? Read, our article entitled: Why is my Betta not eating? Betta’s do very well on flake, pellet, or frozen food. It is important not to overfeed, Betta will eat the whole bag if you’ll let them. Their stomach is roughly the size of their eye, something to help you gauge how much food to give. We feed ours a special Betta flake food called Tetra Betta Plus Flake food. 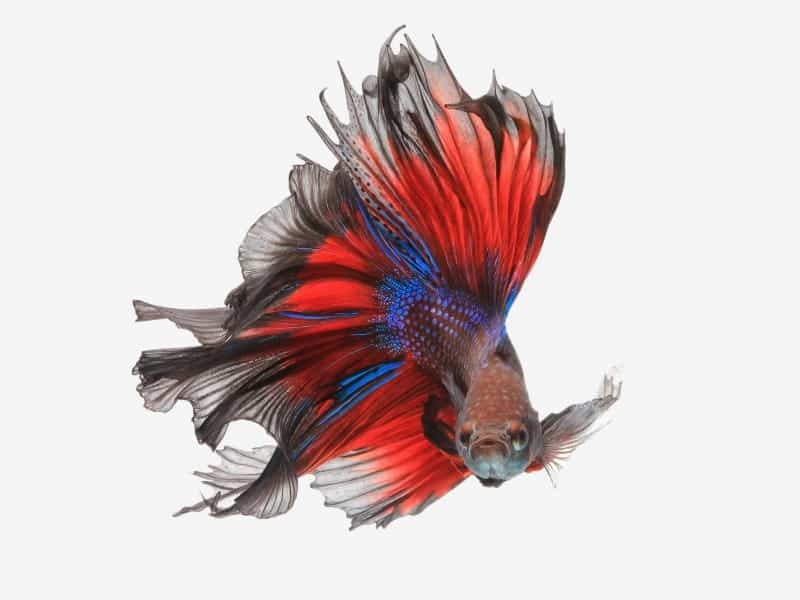 Betta’s sell for around $4 to $20 dollars depending on fanciness. 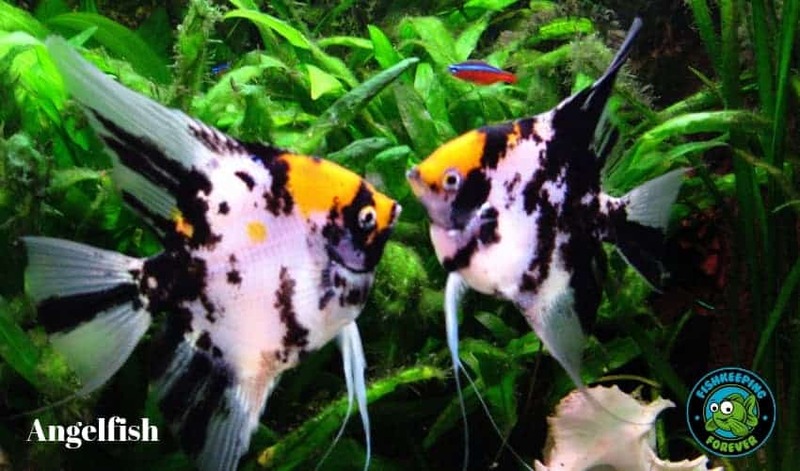 Angelfish have been popular among fish keepers for a very long time. Recognized by their longitudinal stripes and distinct long dorsal fin, Angelfish, are really spectacular to look at. Angels tend to like a group setting, so if you’re only wanting a fish or two, these guys probably are not for you. Not to mention they are prolific breeders so you could end up with hundreds before you know it. A pellet, flake, or frozen food are typically the preferred diets for Angelfish, but they are fish eaters, and any fish smaller than they are may be eaten. And if not given a sufficient amount of food, Angels have been known to turn on their tankmates. Angelfish often sell for around $5 dollars each. Gourami’s might be considered the heartiest of all the beginner fish species. Thanks to the development of a special labyrinth organ, Gourami’s can actually breathe air at the surface. This ability has enabled them to populate slow-moving streams, swamps, marshes, and canals. So, a neglected aquarium is like a day at the spa for Gourami’s. No, you should always keep any pet fish clean and well fed. But for a toddler who may not do the best job keeping the tank clean, Gourami’s are up to the challenge. Gourami’s eat a variety of tropical pellets or flakes, or shrimp pellets. Ours love freeze dried Baby Shrimps. 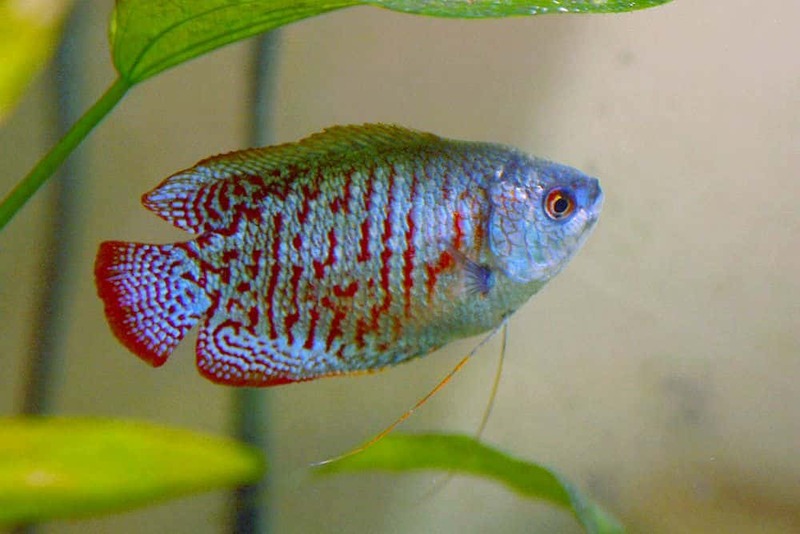 There are several different species of Gourami, so make sure you feed the food formulated for that species. For example, Kissing Gourami’s are actually herbivores and require algae disc or flakes as food. So, be sure to pay attention to what breed you are purchasing. Gourami fish sell for $2 to $3 dollars each. For more information please read our Complete Guide To Gouramis. Kribs have become very popular due to their beautiful colors and small stature. They add a lot of movement and color to any aquarium but like to be with a group of fish. They are used to living in a constantly changing environment, so they are very adaptable and are able tolerate more extreme changes in water quality. This makes them a very good choice for a toddler. Kribs are typically easy to feed but seem to thrive on a varied diet. It is recommended to alternate types of foods, to help boost their immune system. Kribs usually sell for $4 to $5 dollars each. The Clown Loach has grown in popularity because of its beautiful color and stripes, and because of it’s large size. Clown loaches are on the bigger spectrum of aquarium fish with some species attaining 20 inches in length. They are somewhat peaceful, but they do have a moveable spine just under their eye that can be used to inflict a painful wound, so any toddler who likes to stick their hands in the water to pet the fish, may find themselves in need of a band-aid. Not likely, but accidents happen, as anyone who has owned a Yellow Tang can attest. 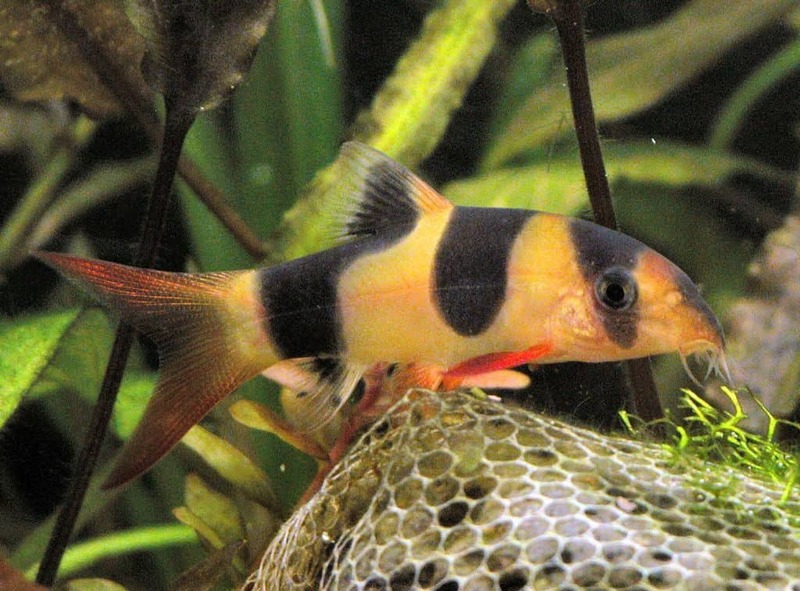 Clown Loaches eat a varied diet and do very well on live or frozen, worms, brine shrimp, or small snails. They are one of the only fishes known to eat bladder snails and have been used to control the pest and sell for around $8 to $12 dollars each. Read our complete guide to keeping Clown Loach. Everyone loves Neon Tetras-They look amazing in groups of 6 or more. Neon Tetras add a beautiful array of color and movement to any aquarium. They do not get very big about 1.5 inches, so it is recommended not to house them with larger fish. 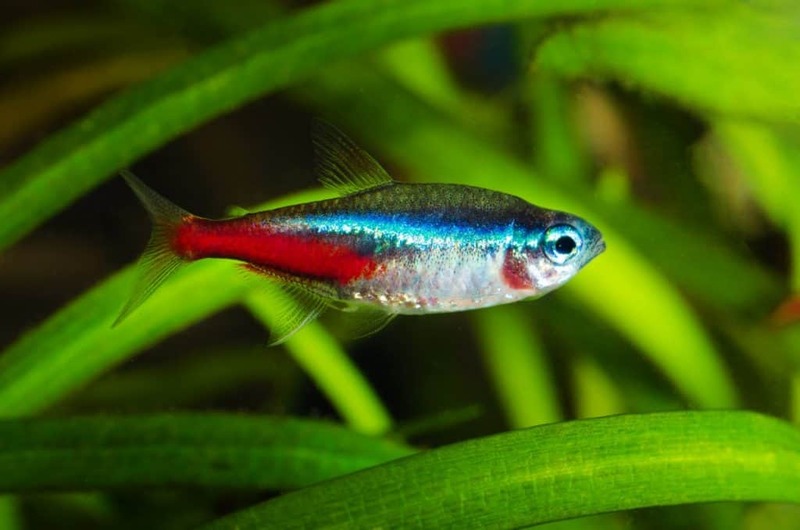 Neon Tetras like to live in groups so it will be necessary to purchase several. If they are not kept in a group Tetras tend to stress and not do very well. They are omnivore’s and thrive on a varied diet of small tropical pellets or flake food, and should be offered brine shrimp, daphnia, or freeze-dried bloodworms to supplement their nutritional needs. Most Neon Tetras sell for around $1 to $2 dollars each. If you like fish in large numbers like schools or shoals then read our article: 14 Best Aquascaping Fish. There are several options to choose from, so it just depends on which fish feels like it is the best fit for you and your toddler. Talking to your local pet store can also help you decide which fish is the best choice for your new aquarists. Buying a fish tank for a toddler or small child is a great way to introduce them into a fantastic hobby and as they get older and start to take care of their fish it will teach them life skills. Caring for any fish is full of emotions and brings our love and affection in all of us and especially young children. They start to name each fish, even groups of Neon Tetras can get individual names. Difficult I know when they all look the same. No matter which fish you buy you’ll be hooked on this amazing hobby in no time at all. Learning how to care for your new pet fish is all part of the journey you’re about to take. For all the basic information you’ll need to set up a new aquarium, Filters and all the equipment you’ll need, you might want to read our Complete Guide to starting a new aquarium. It’s packed with loads of helpful information to make your new hobby easier to enjoy. Sara Ochoa, DVM is a small animal and exotic veterinarian practicing in east Texas. In her free time she loves to travel with her husband and spend time with her 4-legged fur kids.